Note: MovieTexture is due to be deprecated in a future version of Unity. You should use VideoPlayer for video download and movie playback. See in Glossary that are created from a video file. 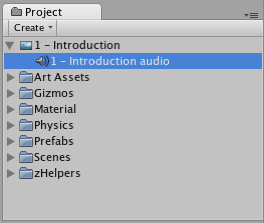 By placing a video file in your project’s Assets Folder, you can import the video to be used exactly as you would use a regular Texture. See in Glossary is very similar to the regular Texture Inspector. See in Glossary, just like a regular Texture. See in Glossary or Hierarchy View. Usually, this will be the same GameObject that is showing the Movie. Then use audio.Play() to make the the movie’s audio track play along with its video. See in Glossary. 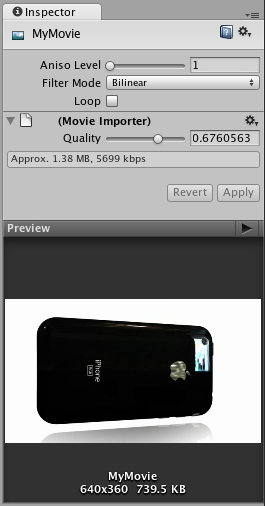 Instead, full-screen streaming playback is provided using Handheld.PlayFullScreenMovie.